Image caption This Facebook message - one of the milder ones highlighted by the campaign - says "If you washed properly, you wouldn't be so dirty." The slogan below reads: "Virtual racism, real consequences"
Brazilians who post racist abuse online may see their words blown up and pasted onto billboards near their houses. The campaign is called "Virtual racism, real consequences" and it's backed by Criola, a civil rights organisation run by Afro-Brazilian women. The group collects comments from Facebook or Twitter and uses geolocation tools to find out where the people who have posted them live. 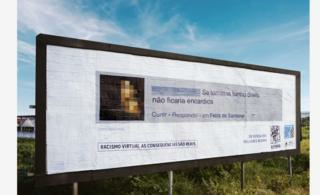 They then buy billboard space nearby and post the comments in huge letters, although names and photos are pixelated. Criola's founder Jurema Werneck says the campaign is intended to encourage people to speak out and report racism. "Those people [who post abuse online] think they can sit in the comfort of their homes and do whatever they want on the internet. We don't let that happen. They can't hide from us, we will find them," Werneck tells BBC Trending. There are laws against racial abuse in Brazil, but Werneck thinks the authorities haven't done enough to enforce them, and that many people are afraid to speak out against racist abuse. Brazilians who identify as black (sometimes called "Afro-Brazilian") make up 7.6% of the population according to the country's 2010 census. Mixed-race or "pardo" Brazilians, who may have a degree of black ancestry, make up a further 43%. The campaign was sparked by an incident where a popular black weather presenter became the target of crude racist remarks. The insults were hurled at Maria Julia Coutinho after her photo was posted on the Facebook page of Nacional Journal, a prime-time news programme. Ironically, the photo was posted on 3 July, which in Brazil is a national day against racial discrimination - and the racially charged comments were quickly overwhelmed by thousands of messages expressing support for Coutinho. "I just printed of all the comments on this post and I will report them to the appropriate authorities. Racism is a crime," said one Facebook user. The billboard campaign has been running since the summer, and Werneck says she has received mostly positive reactions, including many from Brazilians who aren't black. The campaign has also generated some debate on the social networks it's highlighting. "I thought this was fair and just, shining a light in the face of racists," commented one Facebook user. Another said: "Be careful how you comment you might be the next one to have your words on a billboard." Others, however, were less impressed. "Everyone gets abuse on the internet, not just black people," said one commenter on a newspaper website. "If you don't want to be offended, don't go on the internet."